By Kay Tan in Desktop. Updated on May 7, 2018 . 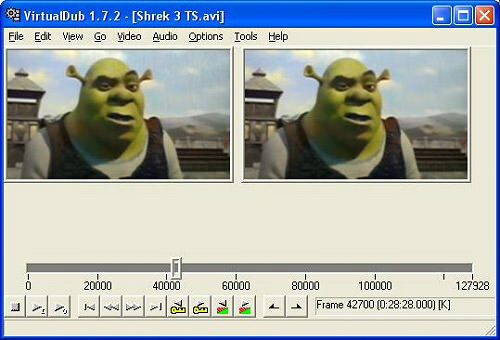 Video editing could be very money consuming due to its requirement for large hard-disk storage, high computer performance and expensive video editing software. Because of all of these, it makes nearly impossible for end users like us (or me at least) to afford the fun of video editing. At the point this article is created, Adobe After Effect CS3 still cost about USD999 per copy while Adobe Premiere Pro CS3 costs about USD799 per copy. This point is, if you are not going to use them frequently, it’s really not worth getting a copy for just couple of one or two video editing. There’s tonnes of free tools that do the job fairly well. Here we bring you 30 free web services and tools for video editing. 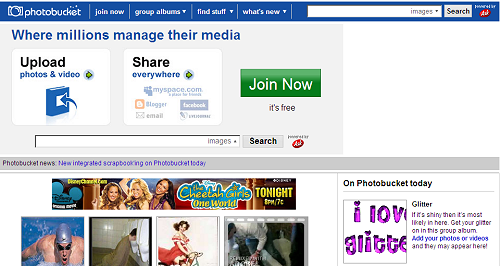 You don’t pay a penny while enjoying the fun of video clips editing. Full list after jump. Eyespot provides video editing and sharing software that can be easily embedded in any website. 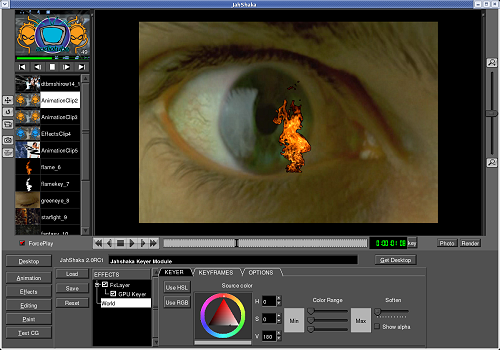 Eyespot allows you to apply special effects, transitions and even audio dubbing to your videos. Jumpcut is an online video editing and remixing website that lets you edit your videos, create slideshows and post them on any webpage. 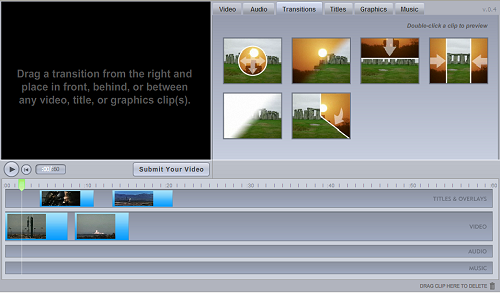 You can add transitions, titles, effects, and audio dubbing. VideoEgg is a video editing platform that lets you create a movie, edit it, while adding effects, making slide shows, create mash-ups, etc- all from within your browser. Photobucket lets you edit your videos using Flash and lets you remix your photos, home videos with cool effects, video captions, transitions and other things. 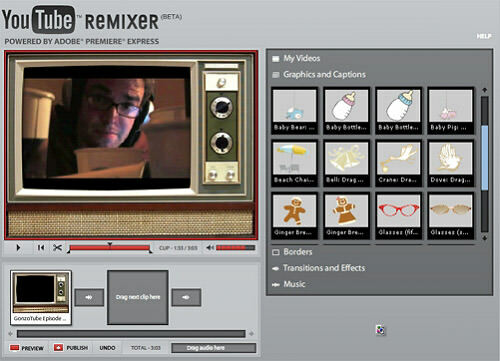 YouTube Remixer lets you add effects and graphics, text and audio, overlays and transitions to your YoutTube Video, directly in your browser. Movie masher allows you to sequence and trim clips, add effects, transitions, titles, and music, using a familiar timeline editor. 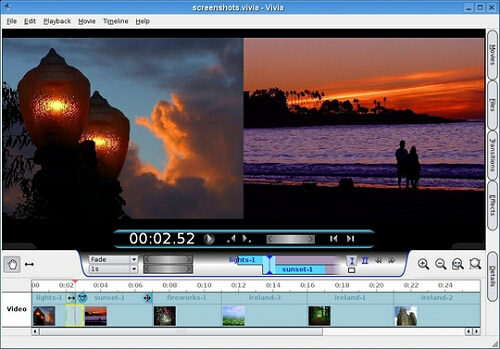 Cellsea is a free online video editor. 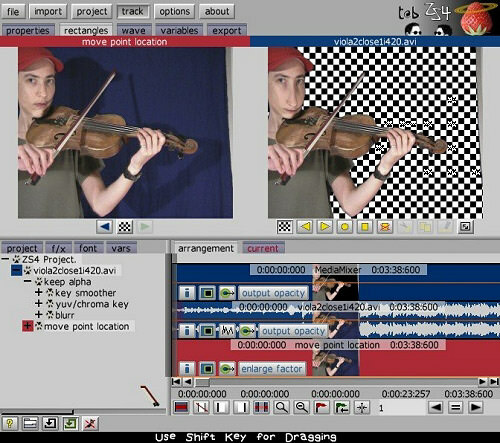 Cellsea allows you to add effects, change size, add sound or simply to convert their videos to another format’Ã¢ÂÂeg 3G for mobile use, MP4 for iPod or PSP etc. 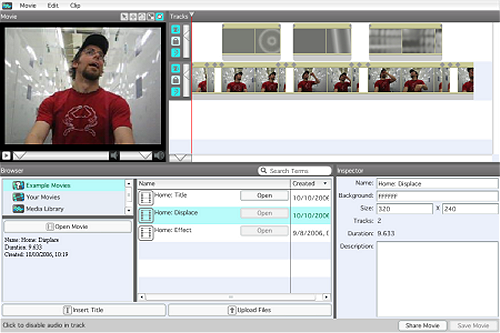 JayCut is a flash-based online video editor. To add clips, music, transitions, or effects to the timeline you simply drag and drop them into place. One True Media mixes your photos and videos with effects to create something wow-worthy. This service features the ability to link to a very specific point or “segment’ÃÂ within the clip itself. Vidavee graffiti adds graphics and text into any video; the service is called a “legal form of artful vandalism’ÃÂ by the creators. 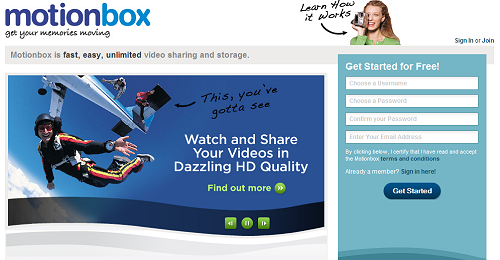 Stash space allows you to upload, store and edit your videos online. You can also record videos directly from your camcorder or digital camera. Kaltura’s open source platform enables any site to seamlessly and cost-effectively integrate advanced interactive rich-media functionality, including video searching, uploading, importing, editing, annotating, remixing, and sharing. 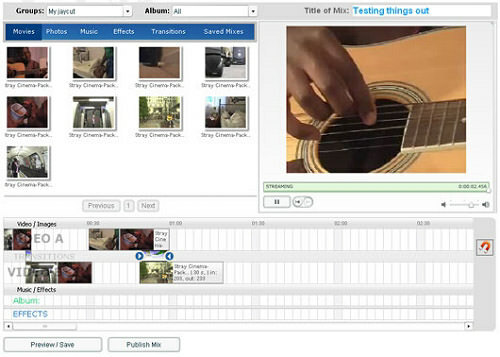 With EditorOne, visitors can edit and publish their own videos on virtually any Website. 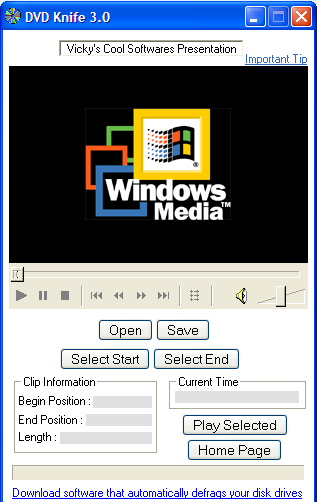 Windows Movie Maker is an equipment you need to make digital movies and get footage from your camera to your computer. 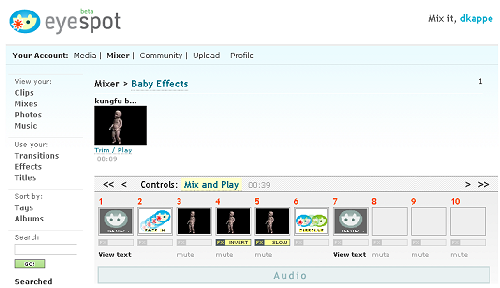 You can create, edit and add special effects to your home movie and share them with friends and family. Jahshaka lets you to edit with flexibility and create effects in real time. 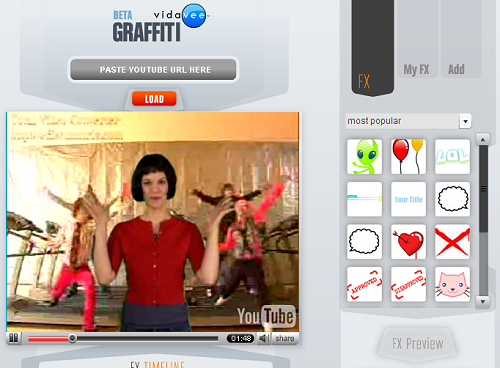 You can also paint and design on moving video. VirtualDub is a video capture/processing utility for video editor with lots of features, including a choice of compression codecs, splitting, addition of audio tracks. ZS4 Video Editor is video editing and composting software which provides media experts with a facility to combine a variety of media types (currently photos, videos and audio files) into one (or more) output file(s). The idea for Wax is to be very general purpose and flexible in video compositing and effects, so that you can compose your dream video sequence with ease everytime. AVIedit allows you to join and split avi files, extract frames and perform video warping, color restore, noise reduction and so on. 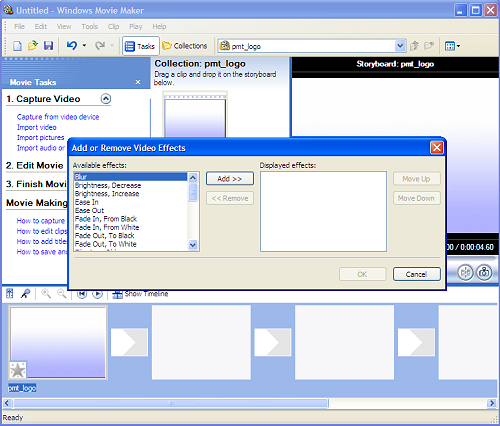 AVI Trimmer is a free video editor for fast and lossless AVI editing. 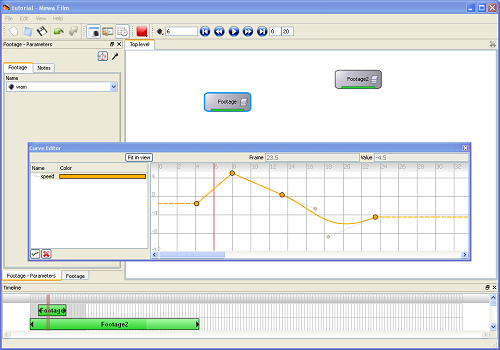 This freeware AVI editor is small, smart, easy to use and involves no encoding/decoding processes. 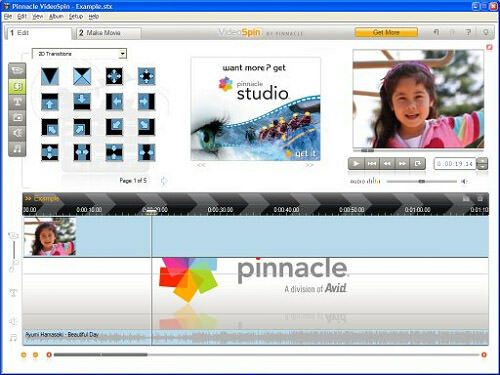 VideoSpin is free video editing software that allows you to create your own movie clips in minutes using your own videos and pictures. DVD Knife is a simple tool for extracting DVD clips from your DVD’s. This is the simplest and fastest tool in its category which has ability to extract long VOB clips in few seconds. 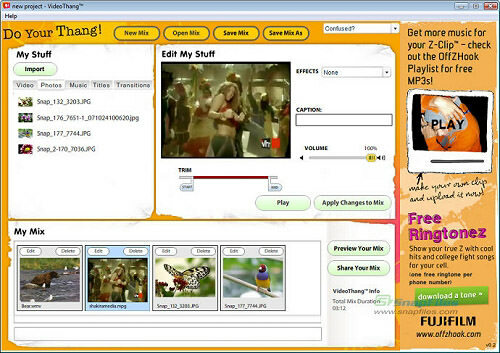 VideoThang enables you to mix video clips with images and background music (.mp3), and save the result as MPEG file for sharing via email, web upload or file on your local drive. 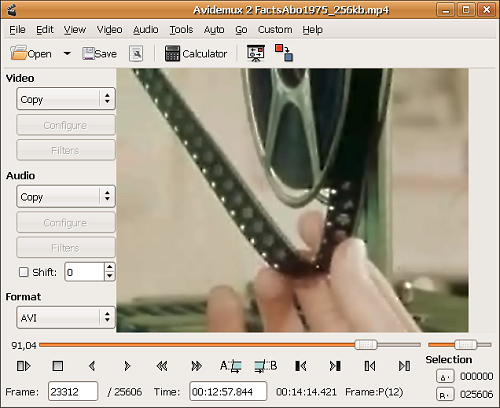 AviTricks is a non-linear, non-destructive AVI video editor with real-time preview. It makes cutting and joining footage easy and includes a wide range of built-in adjustable effects that can be used separately or in combination. Mewa Film is an innovative editorial, effects and finishing video editing application.